It’s easy to understand why tracing each individual particle of light as it travels from a light source and bounces from object to object is unrealistic. But even in the world of rendering, in which we use calculations to approximate the behavior of light in a 3D scene instead of accounting for all available light, the demands on a computer to make light calculations for countless particles in a single image are enormous. The same goes for working in motion graphics and video. Calculations needed to create streams of static images wear on hardware, which prevents many creatives from continuing to work while they wait for their scenes and graphics to fully render. Thankfully, in 2018, many APIs for graphics programs have begun to implement flexibility for working between single-threaded and multi-threaded renders. For example, Unity now conditionally enables and disables multithreaded rendering to allow high-performance machines to render while creatives continue to work. In the early 2000s, professional-level creative software developers began implementing background rendering capabilities into their applications. Initially, these background rendering tasks ate the entirety of a machine’s computing power. Working with digital video and early digital motion graphics tools meant that when rendering, creative workflows had to cease. Even with background rendering capabilities, machine slowdown completely prevented the continuation of any video, motion graphics, or 3D modeling workflow. The solution to improve rendering speed became the render farm. By stacking purpose-built machines capable of handling rendering tasks, creative professionals were freed to continue building models, keyframing, and editing while another project rendered, completely unhindered, in the background. But it takes more than just a powerful system to efficiently assist with rendering. The machine’s architecture has to be prepared for CPU or GPU rendering engines and flexible enough to work as either a turnkey farm or a personal node. Because the rendering demands of a world-class CG movie studio are so distant from those of a budding product design firm, rendering solutions have to be built to accommodate different budgets and business plans. The goal, however, is the same: provide enough power with enough compatibility that creative professionals in nearly any industry can set rendering tasks aside while driving their workflows forward. Multiple GPUs – Dedicated graphics processing has come a long way since the earliest graphics cards and chips. Harnessing multiple processing pathways enables large-scale rendering. Multiple CPUs – For CPU-based rendering, multiple processors with multiple cores keep multi-threaded rendering tasks on the move. 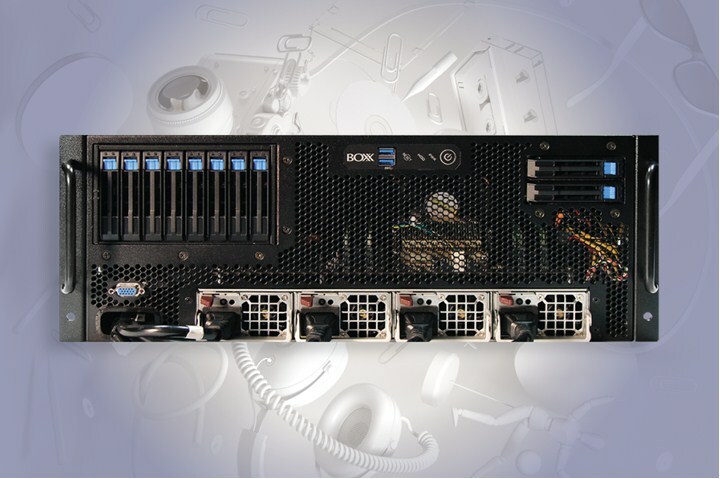 Customizable PCIe slots – Keeping slots available for customizing machines to work within a unique company’s processes and systems is indispensable. Multi-User Support – Large teams need to be able to pull resources from render farms without worrying about changing settings or overloading systems. Interested in seeing first-hand how rendering while you work is possible? Check out BOXX CPU rendering and GPU rendering solutions or talk to us about your workflow needs.